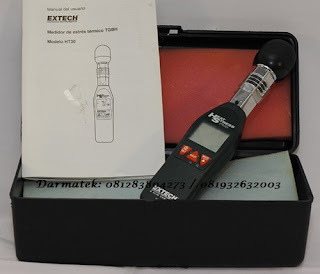 This meter (Extech HT-30) measures and displays Heat Stress Index (WBGT), which is how hot it feels when humidity is combined with temperature, air movement, and direct or radiant sunlight. Black Globe Temperature (TG) monitors the effects of direct solar radiation on an exposed surface. It also measures air temperature (TA) and Relative Humidity (RH). Additional features include: selectable units of °F/°C, Auto power off with override, and a built-in RS-232 interface with optional 407752 Windows® software.